You know how some books are just made for you? You read the description and it has all your favorite elements and you just know before you even pick it up that it's totally going to be your jam? 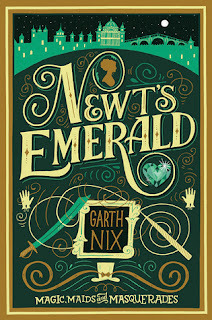 Newt's Emerald by Garth Nix was that book for me. I haven't read a Garth Nix book since roughly 2004, when I discovered the Abhorsen trilogy at my local library. My memory of this experience was that the books were totally weird and I was totally into them. (And they are also totally on my to-read list this summer!) But Newt's Emerald is not at all like the Abhorsen trilogy! It is a Regency-era romance, with magic! Basically, it did what it could to fill the Gail Carriger sized hole in my heart. Lady Truthful Newington (Newt for short) is very eager to turn eighteen and come out to London society. She's pretty, smart, passable at magic, and eager for her adult life to begin. 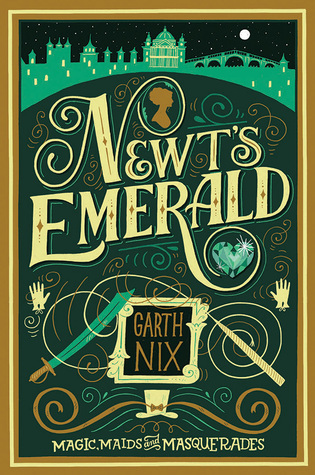 On the evening of her birthday, her father presents the Newington Emerald, a magical gem that will one day be Newt's...only to have it stolen right from under their noses. With her father in hysterics and her cousins quite incapable of rescuing it, Newt heads to London to track down the emerald herself. Unfortunately, she can only do so much as a lady. So she gamely dons a male disguise and entreats the help of one Major Harnett. Together they uncover an insidious plot decades in the making...and an attraction to each other that is threatened by the secrets they both keep. Garth Nix writes this fantastical romance with charm and plenty of humor. The story unfolds and flows easily, and contains many delightful surprises and twists. The characters are all top-notch--from Newt's indulgent but clueless father, her passel of Newington boy cousins, her mysterious and resourceful aunt Lady Badgery, and even Major Harnett himself, who is not at all what he seems. I love Newt because while she does not entertain any great fantasies of adventure or heroics, she is capable and willing to do what she must for her family and doesn't let anything stand in her way. The delightfully ridiculous plot promises a great tour of the Regency era, taking characters from slum warehouses to ballrooms, across London, the countryside, and to sea. Throughout it all, Newt's energy, good humor, and clever thinking continually save the day, making for a fun pseudo-historical and feminist book. Book purchased from my local indie! The cover and packaging were too pretty to resist! Sabriel is one of my favorite books of all time. So glad you mentioned this book that I was unaware of. I picked up a copy at the library this morning!